In 2018, retailers are still making this terrible mistake. Another day, another terrible corporate marketing decision. 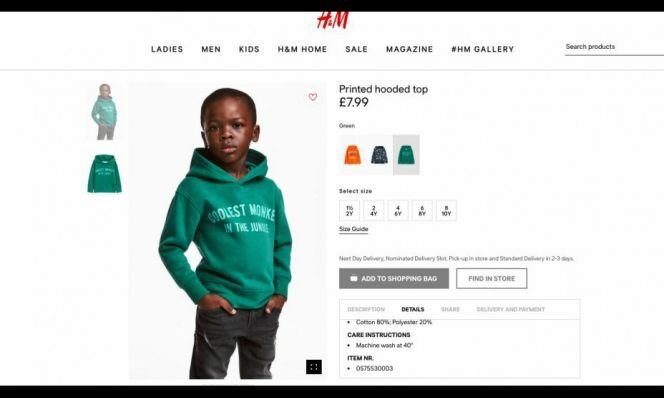 Clothing retailer H&M is receiving backlash from people outraged by a hoodie. Not just any hoodie. This one read "Coolest Monkey in the Jungle" on the front. Seems innocuous enough, until you notice the hoodie was being modeled by a young black boy. The reason that&apos;s a problem is that historically, people of African descent have long been compared to monkeys and gorillas. Referring to a black person in this manner is a racial slur. The Huffington Post has an essay about the history of the comparison here. New York Times columnist Charles M. Blow helped bring the offensive photo to the mainstream when he tweeted on Sunday: "@hm, have you lost your damned minds?!?!?!?" Then the rest of the Twitterverse piled on, and H&M issued an apology and removed the photo that featured the model. The hoodie is still available for sale.